Here is one of my new, favorite beauty items. I guess, I just love the clean, fresh scent and the light feel of this body wash. It isn't heavy and greasy like some of the more expensive body washes. And yet it lathers up supremely. One of my friends says it's so gentle, she bathes her 16 month old in it. It is truly baby soft. Nothing harsh in the ingredients, either. I stumbled upon it in the drug store. And it's a great buy. Under $5.00 for 24 fl.oz. That's huge, as far as body washes go. Ivory Simplement Moisturizing Body Wash in Fresh Snow. I know, a long title, but it's worth the money. 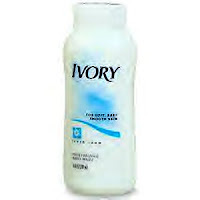 Like all Ivory products, it's pure and mild with a rich, creamy lather, and yet rinses away completely, and smells like fresh laundry. You will feel as soft as a baby. And if you wish to enjoy a bubble bath, this Ivory wash can create a magical tub full of bubbles. The scent is heavenly....not girlie. Just fresh and clean. Your man will like the Ivory, too. I have two big bottles of Ivory Simplement. And I haven't grown tired of the product yet. Give it a try.